Avoid consuming smelly food at your desk. Whether you're renting shared office space with a bunch of fellow freelancers or working a permanent desk job, it's important to observe a few points of basic office etiquette. Ignoring standard rules of acceptable office behavior won't endear you to your co-workers and could ultimately damage your working relationships and lead to unnecessary workplace tensions. Treat all the people who share your work space with the dignity and respect you'd like to be shown, irrespective of their job title. Don't be snooty or aloof with maintenance workers or catering staff. Take the time to get to know all the people you work with by name. Some could interpret a failure to do so on your part as a sign you don't value them, according to the Columbia University Center for Career Education. Be friendly and open, but don't reveal too much about your private life and don't expect others to, particularly at work parties where a glass or two of vino may have been consumed. Outside of work matters; keep your personal opinions about your co-workers to yourself. The state of your work area can have an impact on those around you, even if you're not directly impinging on other people's space. 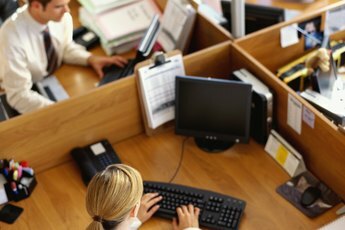 Always keep your desk neat and tidy, especially if your office operates a "hot desk" policy that involves multiple workers using the same work station. If you're going to decorate your area, consider the sensibilities of others. Don't put up anything that could potentially offend the people you share your work space with. The same goes for your computer's screensaver and wallpaper. You should also be conscious of any websites you visit that aren't work related. If you wouldn't be comfortable opening a web link in front of your parents, don't do it at work, no matter how liberal you think your work colleagues are. 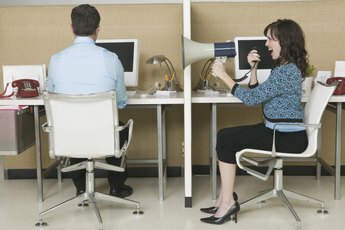 You'll soon start to get on your co-workers' nerves if you're persistently creating unnecessary noise pollution. Keep personal phone calls to a minimum or save them until you're taking a break away from your desk. Keep your phone's ring tone low or stick your handset on vibrate. If you're planning a meeting in your office, book a conference room so your discussions don't distract your fellow workers. Use headphones if you need to watch or listen to streaming video or audio online, especially if it isn't work related. Office equipment specialists Haworth advise in a "Workstyle Whitepaper" that activities as seemingly innocuous as chewing ice or clipping your finger nails could soon rub your office neighbors the wrong way. Eating at your desk may save you time, but the people who have to share your work space will be unlikely to appreciate you digging into an aromatic lunch from your local deli. If you must eat smelly food at work, take it into your office's kitchen or dining area. When preparing food or making yourself a drink, always wash and tidy after yourself. You should also be conscious of indulging in noisy snacks such as potato chips if others are working around you. 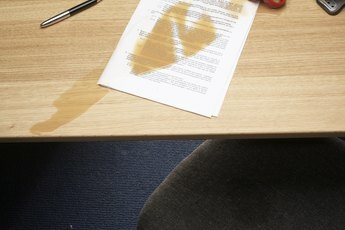 The University of the Pacific recommends you should avoid gum-popping, humming and slurping while at work too.